Shortly before we left on this trip I did a search to see if the Tour would be anywhere near us while we were in France. 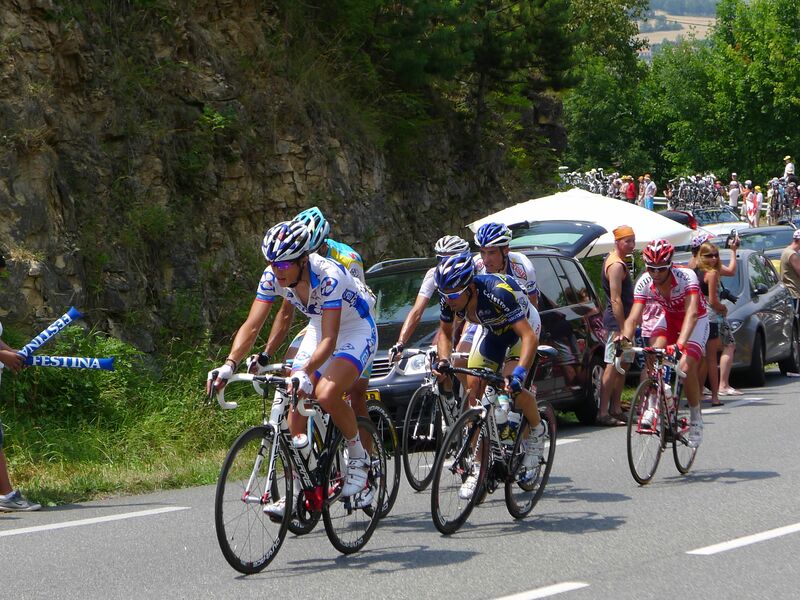 As it happens, it was rolling through Figeac a few days after we arrived, so we made plans to watch this stage ‘live’. It is amazing that you can just drive along the route a few hours before the race and just pull off the side of the road and set up camp. 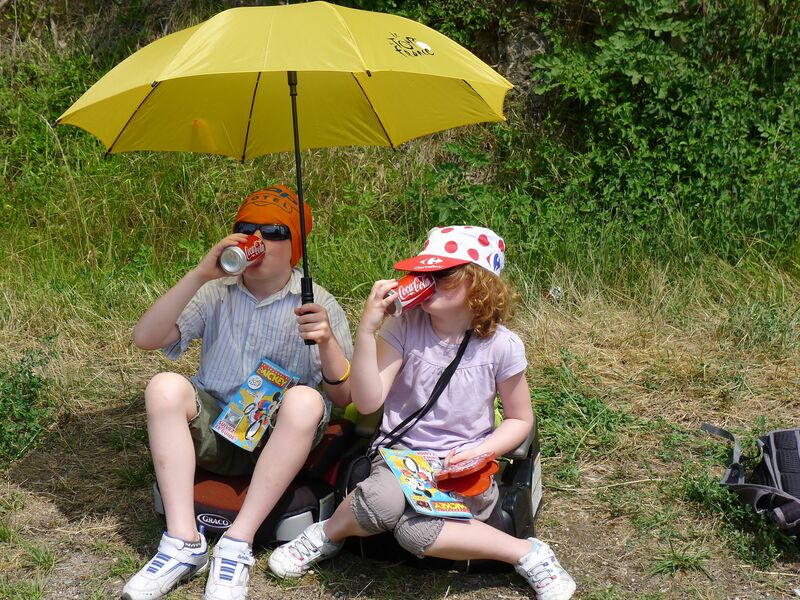 We decide to camp out near the summit just outside of Figeac. We only have a bit of shade which is unfortunate, but then one of the many vehicles selling stuff comes along and we buy an umbrella. Guess how hot it is today? 102. The photo above is the breakaway group. 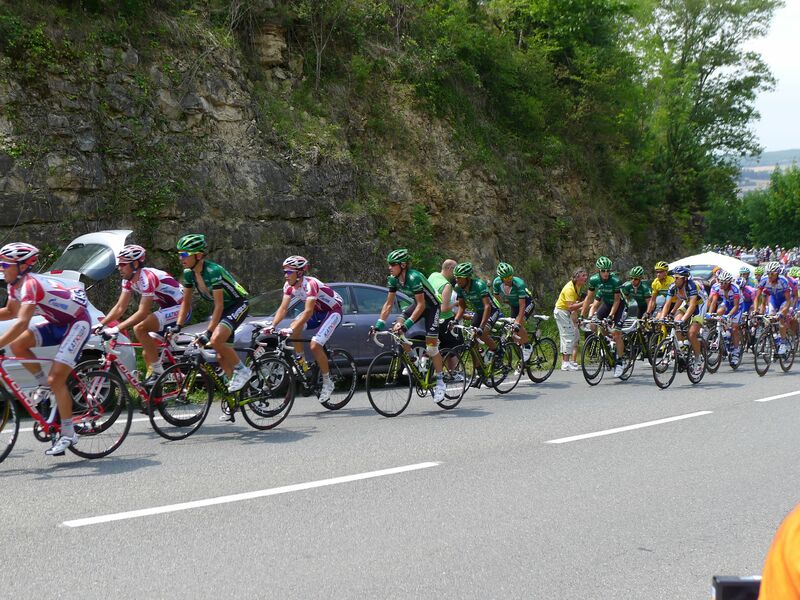 The photo below is of the peleton. You can see Thomas Voeckler in the yellow jersey about 10 back. The whole cycling aspect was a blur. In retrospect we should have had Cooper video the cyclists as they were gone before we even realized it. Hours of waiting on the side of the road and then about a minute or less of actual cycling activity. It was, we all felt, anti-climactic, but something that we were glad to have seen. I guess when you watch it on television, the coverage is so fluid that you don’t realize how quickly they pass through, even though that is completely logical. After all was said and done, it was back into Stinky and then over an hour to drive back down the hill (which was under 1km) and back into Figeac.